The pickups are wired in parallel, like in Startocasters. The original Red Special got them in series. It's a huge difference. As you can see, there are six switches, like in the May's guitar. The difference is in combinations and types of these things. 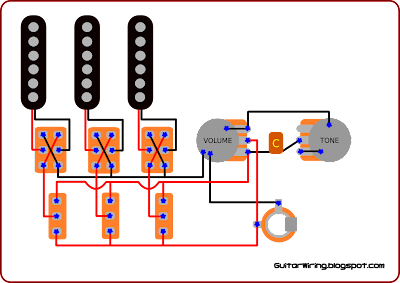 There are three DPDT on-off-on switches, which are used to switch off the pickup from the circuit, or to change the phase. The centre position is "off". The three switches in the next line are SPDT on-on types. These things can switch the pickup to the volume and tone control, or connect it directly to the jack socket. If we will connect the pickup to the volume and tone control, it will be working like in a typical "volume + tone" circuit. If we will connect it directly to the jack, we will get the tone with less impact from the volume pot. With this function you can select which pickup will be working with full volume, and which will be a little bit muffled by the pot. If we will change the phase of one of the pickups, when other one is also "on", we will get a much different tone, than from common, parallel circuit. With this kind of guitar wiring we have A LOT of combinations.